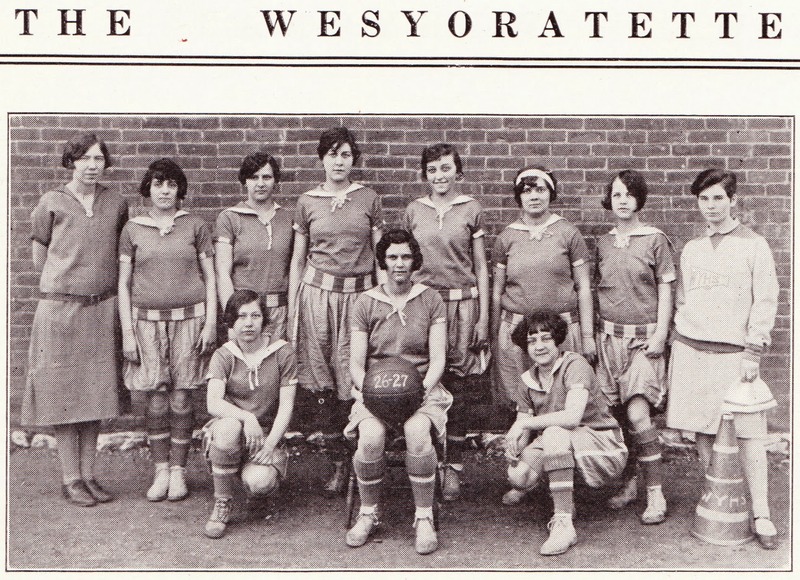 The yearbook is filled with fabulous material, and I'm going to write more about it in 2014, but what caught my eye the first time I flipped through was the story of Helen Myers and the 1926-27 West York girls' basketball team. "The West York High School was represented by the best girls' team in the history of the school. All but one of the first team members were Seniors and will be graduated this spring. However, the material left seems to insure a successful season next year. "Every member was a star. Helen Myers and Wilhelmina Bufflap at all times outplayed their guards. Anna Joseph and Kathryn Sheffer2 in center held their own against all odds. Margaret Stauffer, Catherine Neiman, and Marguerite Strayer as guards put up such a mighty battle that West York outclassed its opponents with a total score of 622 points to 390. "For the first time in the history of York County a Girls' Scholastic League was formed. Those teams constituting the League were West York, Red Lion, Wrightsville and Glen Rock. It was in this League that West York played the best games of the season, and was one of the title contenders for the Cohen trophy. The officials of the league decided not to have a play-off and accordingly each of the three teams, West York, Red Lion, and Wrightsville received a separate cup.3 This cup was the first trophy ever brought to the high school by a basketball team and was a fitting reward for the unique records made by the tossers." While it's stated that this was a girls' basketball Dream Team, one player obviously stood out — team captain Helen Myers. "The most outstanding part of the basketball season was the wonderful record made by Helen Myers, captain and star forward, of the girls' basketball team. This miss scored an amazing total of 503 points — just ten less than the score of the entire boys' team. Helen garnered 226 field and 51 foul goals in fourteen games or an average of 35.95 points per game. "During the entire four years of Helen's sojourn in High School, she has been a member of the varsity basketball team and for the past two seasons has held the position of Captain. During the first three years of her membership on the team her regular position on the floor was center. It was only during this past season that she occupied the position of forward. "Thus on March 30 in a game versus the Manheim High School team Helen played for the first time in her new position. However, she inaugurated herself into this new position by scoring a total of 61 points out of the teams 73, making 30 field and 1 foul goal. This feat was claimed as a record and the story of her prowess was carried throughout the entire state and county in papers and magazines.4 It was not only in this game that Helen starred but in all the remaining games of the schedule. "In a later game with the team from Hallam High School, Helen broke all state records by scoring a total of 75 points, all but two of the total points made by her team. Because of this feat she is now holder of the State record of individual scoring." One thing I should have noted earlier is that Pennsylvania high school girls' basketball was a six-on-six game at this time and for many decades thereafter. I believe that six-on-six persisted in Pennsylvania until at least the mid-1960s, and possibly later. Myers was more than just a basketball standout. Her full name, according to the yearbook, was Helen Romaine Myers and her nickname was "Hellie." She was her class secretary all four years, was a member of the Athletic Association, was the sports editor of Blue and White (the bi-weekly student newspaper) as a senior, was the business manager of the Ladies' Home Journal Campaign, sang with the Glee Club, competed on the track and volleyball teams, participated in the minstrel show, and was a member of the Alpha Beta Literary Society. Presumably she went to her classes, too. According to her yearbook profile, her ambition was to be a sergeant. Helen Romaine Myers Bowers died on August 29, 2006, at the Lila Doyle Nursing Center in Seneca, South Carolina. She was 96. She was survived by three children, eight grandchildren and 14 great-grandchildren. According to her short obituary, "she married Henry Bowers, who preceded her in death. She was a 1934 graduate of Hood College, a homemaker and a Presbyterian." There is no mention of basketball. "Desiring a delightful reminder of the glorious days in W.Y.H.S. we have published this, the first issue of 'The Wesyoratette,' in which we have tried to recount some of the joys and achievements of our four years here. We have striven earnestly to make this issue a success. Nevertheless, our mistakes are manifold, but in seeking them out, pray be lenient, gentle reader, and consider the extreme youth of our publication. May it bring back to us memories, sweet and satisfying, of our school days!" 2. Kathryn Sheffer is correct. Her first name is misspelled in the photo caption on the girls' basketball yearbook page. 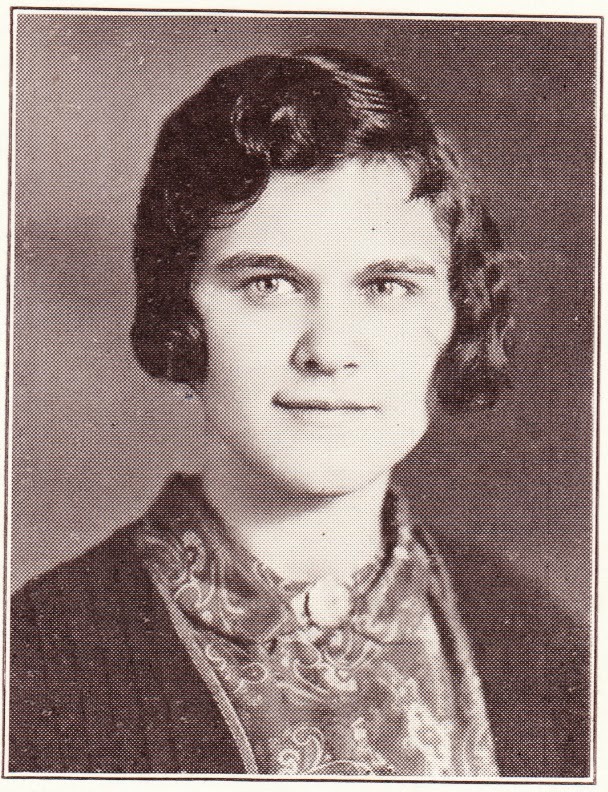 According to her yearbook biography, her nickname was Kitty, she had a "melodious giggle," and her other activities included Glee Club, Alpha Beta Literary Society, yearbook staff, and the History Society, for which she served as treasurer. 3. So, to be clear, it seems that, in the four-team league, West York, Red Lion, and Wrightsville tied for first place and Glen Rock finished last. 4. A couple of things about this. First, I found a one-column photo of Myers in the January 11, 1927, edition of The Yonkers Statesman. The caption stated: "The first bid for basketball fame comes from York, Pa., and there is a feminene [sic] flavor to it. Recently Miss Helen Myers, star forward of the girls high school team of West York, Pa., scored 61 of 73 points made by her team in a recent game. Her record was 30 field goals and one point from foul, an average of a goal from field for practically each minute of play." Second, I think there might be a mistake with one of the dates mentioned in the Wesyoratette. The yearbook states that the 61-point game occurred on March 30 against Manheim High School. But the Yonkers newspaper notice appears on January 11, 1927. So perhaps the 61-point game was on December 30? 5. Also according to Lucky's Amazing Sports Lists, 1966 York Country Day School graduate Coni Wolf once scored 54 points in a six-on-six basketball game.